I've been browsing around on other food blogs for the last couple weeks. Everyone has wonderful ideas for Thanksgiving - I've seen about 30 different recipes for cranberry sauce. I think this one is my favorite because you bake the cranberries in the oven, which means no messy stove top! Win: Jane Deere's Cranberry Sauce. Since I am a newbie food blogger, and I will have Thanksgiving recipes coming out of my ears after Thursday night, I want to share a totally non-related recipe. I think this may be my favorite recipe that I've shared on my blog so far. Not in terms of the preparation (it's a little tricky!) but the FLAVOR is out. of. control. 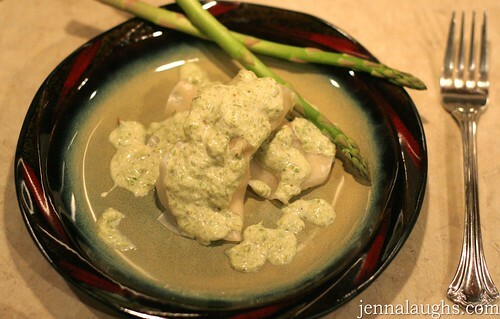 The sausage adds a wonderful flavor to the ravioli, then you cover it in a creamy asparagus sauce. It's so delicious. Mom and Michael had a hard time deciding if their favorite recipe so far is my cashew chicken lettuce wraps or this. I think this one was the winner. Start by making the cream sauce, which doesn't have cream at all! I made a light version, that is still incredibly rich. 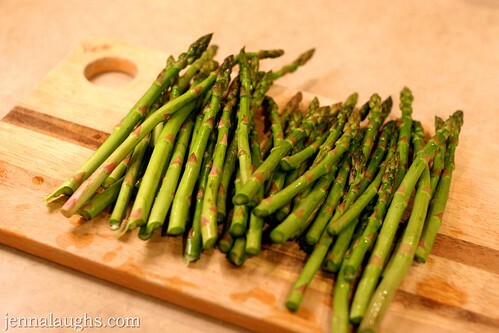 Grab a bunch of asparagus, break off the tough ends and rinse them in the sink. 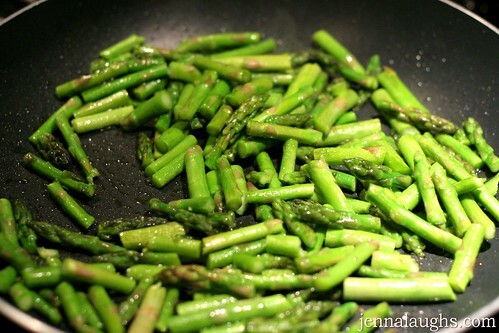 Chop the asparagus into small pieces, and put them in a skillet with some olive oil. Let them cook for a good 10 or 15 minutes, so they get soft. Add minced garlic to the pan and let that cook for 3 or 4 minutes. Add 1/4 cup of chicken stock, salt and pepper. Let the stock reduce for a few minutes, then remove from heat and let it sit until the stock stops bubbling. Pour the whole thing into a food processor. 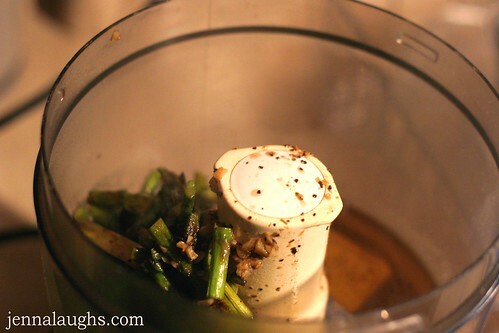 Blend it until the asparagus is broken up and a thick paste remains. Add sour cream and blend again, until a thick sauce is formed. It's a little too thick at this point, but we are going to add hot pasta water right before we serve it. That will warm and thin it = perfect. 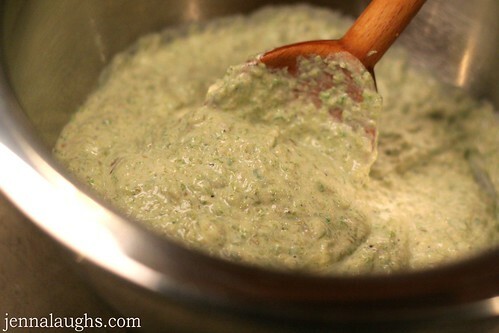 It's a beautiful, rich green sauce. It's slightly tangy from the sour cream. Now it's time to make the ravioli filling! Exciting. Cook one pound of sausage. 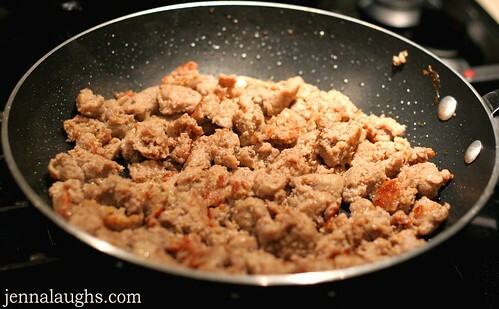 I used sweet Italian turkey sausage. Break it up as much as you can. I learned afterward that the sausage should be smaller than the above picture, it is easier to fill the ravioli. Trust. 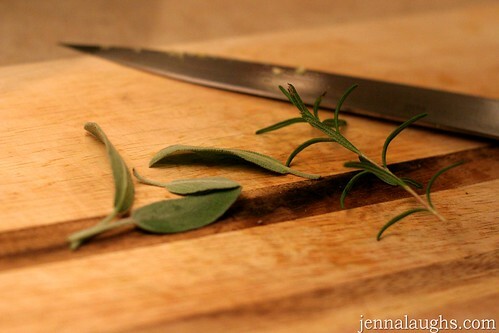 Chop up fresh sage and rosemary. Smell. Smile. Add it to the pan. Next comes ricotta and Parmesan cheese. That's it! You have a perfect, flavorful filling. Lay wonton wrappers on a cookie sheet, cutting board, your counter top - whatever works. 1. Break the sausage up as much as possible. The large chunks were splitting the ravioli open = disaster. 2. Use way less filling than in the above picture. Just by looking at it, you can tell the sides did not fold over evenly and the raviolis were coming apart in the boiling water = disaster. 3. It worked the best when I went around with some water and moistened all four sides of the ravioli first, then picked up each one with wet fingertips to form the raviolis. 4. Let the water stay at a gentle boil. A rolling boil is a little too rough for this. 5. Make them in small batches, about 5 or 6 at a time. 6. They only need to cook for a few minutes. I overcooked my first batch. They got too soft and when I tried to scoop them out, they broke apart in the water = disaster. Basically, by the time I was done, my pot of boiling water was the color of milk. Lesson learned. Despite the complications of this recipe, I really do hope you try it... because the flavor combination works together so well. To make the sauce, wash asparagus and break off the tough ends. Chop into thirds and put in a skillet over medium heat with oil. Stirring every few minutes, cook for 10 to 15 minutes, until the asparagus is soft. Add minced garlic. Cook for 3 or 4 more minutes. Add chicken broth, salt and pepper. Let the broth reduce a bit, then remove from heat. Let the pan sit until the broth stops bubbling, then pour it all into a food processor. Blend for 20 seconds or so, until the asparagus is pureed and forms a thick paste. Then add container of sour cream. Blend for another 10 seconds, or until it forms a thick sauce. Pour into a bowl and set aside. To make the ravioli, brown sausage in a skillet over medium heat, about 6 minutes. Break up the sausage as much as possible, you don't want large pieces. Chop sage and rosemary, add to pan. Add Parmesan cheese, stir. Remove from heat and add ricotta cheese, combine. Filling should be thick. 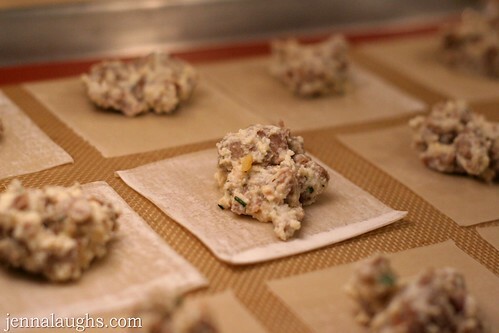 Spread the wonton wrappers out on a cookie sheet or large cutting board. Put one teaspoon of filling in the middle of each wrapper. Put some room temperature water in a small bowl. Moisten all four sides of the ravioli, then with wet fingertips, fold the wrapper in half over the filling, forming the ravioli. Pinch the sides together, set aside. Once all raviolis are formed, carefully place them into a large pot of gently boiling water, in small batches of 5 or 6 at a time. Cook for 3 or 4 minutes, until they come to the surface. Remove with a slotted spoon and set aside. Once they all are cooked, add 1/2 cup warm pasta water to the asparagus sauce. This should thin the sauce and make it easy to pour over the ravioli. Add more water if necessary. Serve ravioli on a plate drizzled with sauce. And I am definitely going to try this! It looks DELICIOUS. You are so creative. 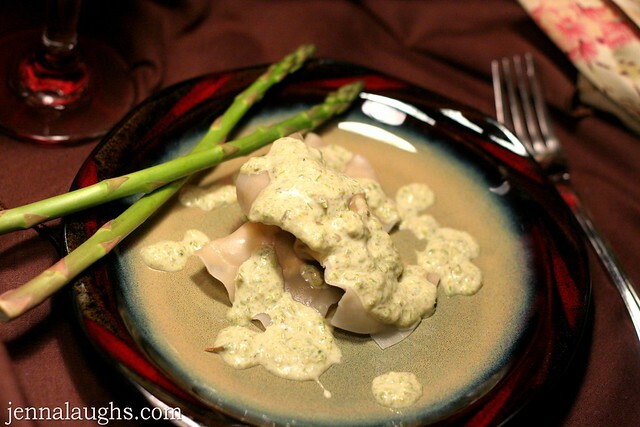 I never would have thought about an asparagus cream! I love the idea! These ravioli look absolutely delicious! You did such a great job with them! Thanks for the shout out! I'm glad you like the cranberry sauce! This ravioli looks delish! I can't wait to try it! Looks good, I will try it soon. I wanted to pass on my sausage cooking tip. 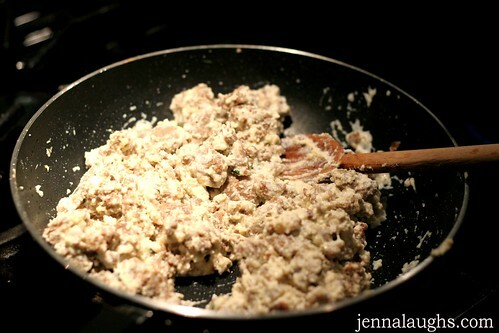 I use a potato masher when cooking Italian sausage meat, to mash and cook it as it cooks. It is the easiest way to keep the sausage from cooking in lumps.